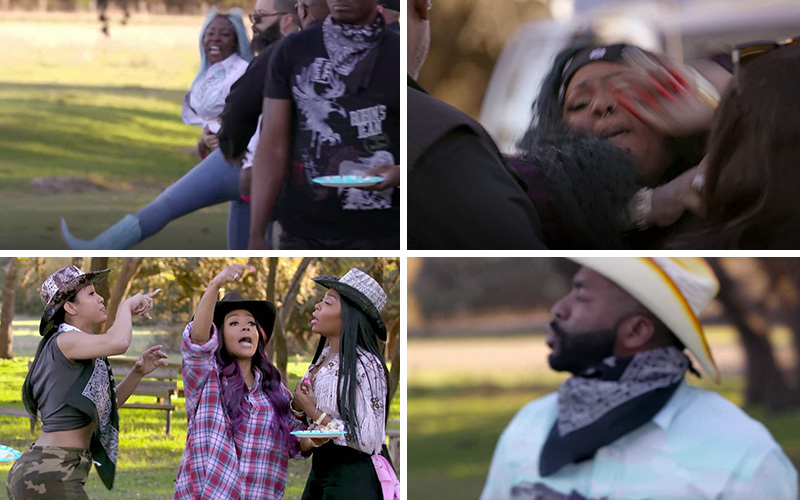 If you thought Tokyo Vanity and Spice’s purse-throwing brunch brawl on last week’s episode of Love & Hip Hop Atlanta was the last of their beef, you were sadly mistaken. On this week’s episode, Spice and Tokyo continued their feud with a rousing round two, and this time, damn near everyone else ended up getting into brawls of their own on the side. For the past few episodes, Tokyo and Spice have been going at it ever since Tokyo found out her her ex, Tabius, had moved on and was messing around with Spice. Last week, Tokyo (almost) introduced her purse to Spice’s head after Spice kept taunting her about her weight, and this week, the pair ended up sparring again at the dude ranch. Everyone was sitting down enjoying tacos and burritos when the subject of Rasheeda’s Pressed launch in Houston the night before came up. Spice thanked Rasheeda for the good time, and when Tokyo was trying to explain why she wasn’t there, Spice interjected. Spice said she didn’t appreciate being talked about behind her back, and Tokyo said she didn’t appreciate being disrespected by Spice. Rasheeda tried to calm the storm, but it was too late by then. Like lost balloons, tensions were already too high for them to be brought back down. Tokyo tried to go after Spice, but security swooped in and held both of them back as BK rushed over to try and calm Tokyo down. Spice and Tokyo’s fight sparked another battle between Estelita and Sierra when the former accused the latter of flip-flopping between Tokyo and Spice.